The purpose of this tutorial is to demonstrate sending data to a server, and then receiving information in return. This is useful for a variety of functions: verifying an username and password, updating information in a database on the server or requesting information from the server. The program to be developed will display a textarea. When the Send Data button is clicked, the information in the textarea is sent to the server. The server then replies and the program puts the information in the reply into the results area. The technique used is Ajax. 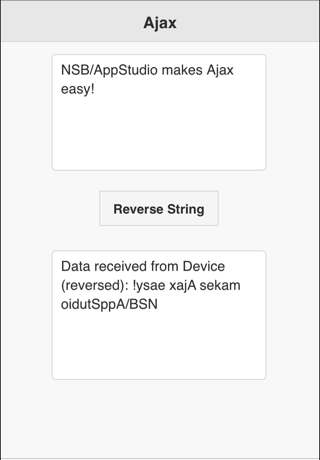 For much more information on Ajax, read Ajax made Simple. The program this tutorial produces is available in Samples Folder 7/Ajax and ReadFile, which comes with App Studio. It is called Ajax. The two TextAreas have their id set to txtSend and txtResponse. The Send Data button should have the id of btnSendData. The Ajax() function sends the text to ajax.php, a program running on the server. When the Ajax call completes, the function 'done' is called. 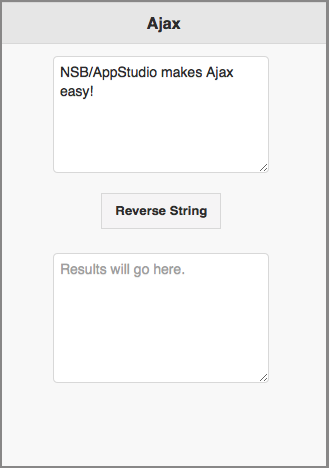 The text following the question mark in the Ajax function is called a Query String. The maximum size is quite high - people have tested sending as many as 80,000 characters. On the server side, ajax.php waits for messages from client apps. There are a number of other programming languages and techniques for doing this. Others include ASP and CGI. // Get the data from the client. The first line of code in this script reads a value from the query string. We named the value of txtSend 'myText' in the query string, so that value is put into a variable. The second line echoes the contents of myText back to our app, but reversed. It will be put into the req object which we DIMmed. The final line of the server side script sends the results back to our app and calls the done() function. The results are in req.responseText. This page was last edited on 27 August 2015, at 08:51.